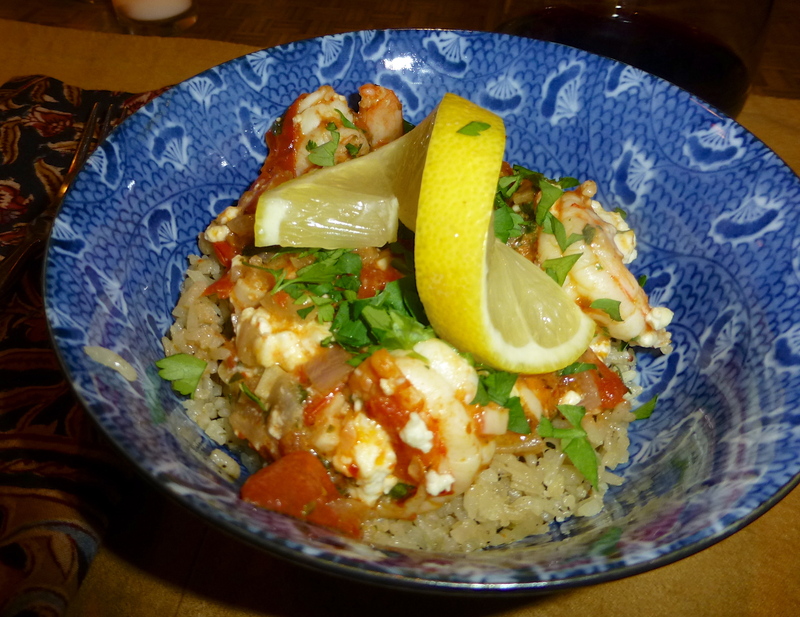 Luck (and Greek Baked Shrimp). Someday, I’ll write a big, long post about why John is amazing. He’ll be embarrassed and I won’t care. 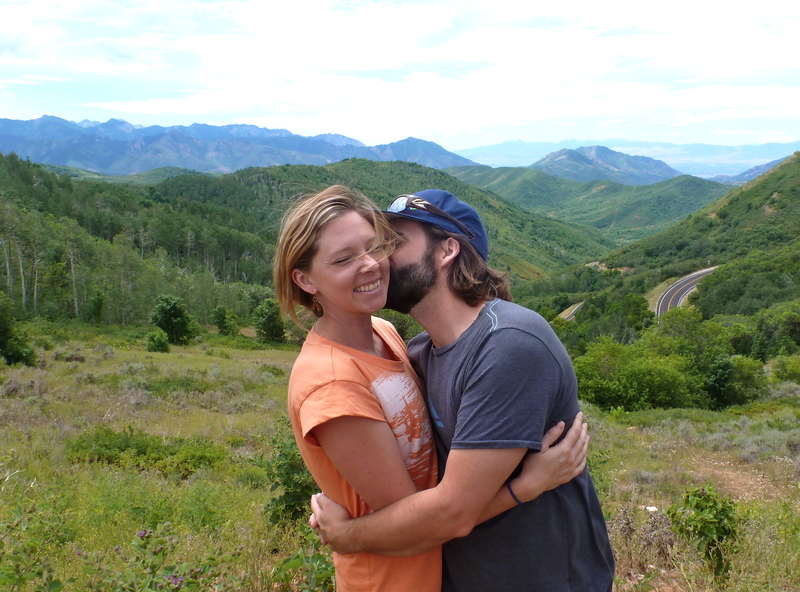 For now, let’s just say that he’s a Wonder Husband and I’m a lucky girl. Yesterday, I was struggling with a few weighty issues that were bringing me down. Instead of trying to talk me out of being emotional, John supported me in all sorts of ways. Sometimes that means taking the dog out so that she gets exercised when I just don’t have the energy. 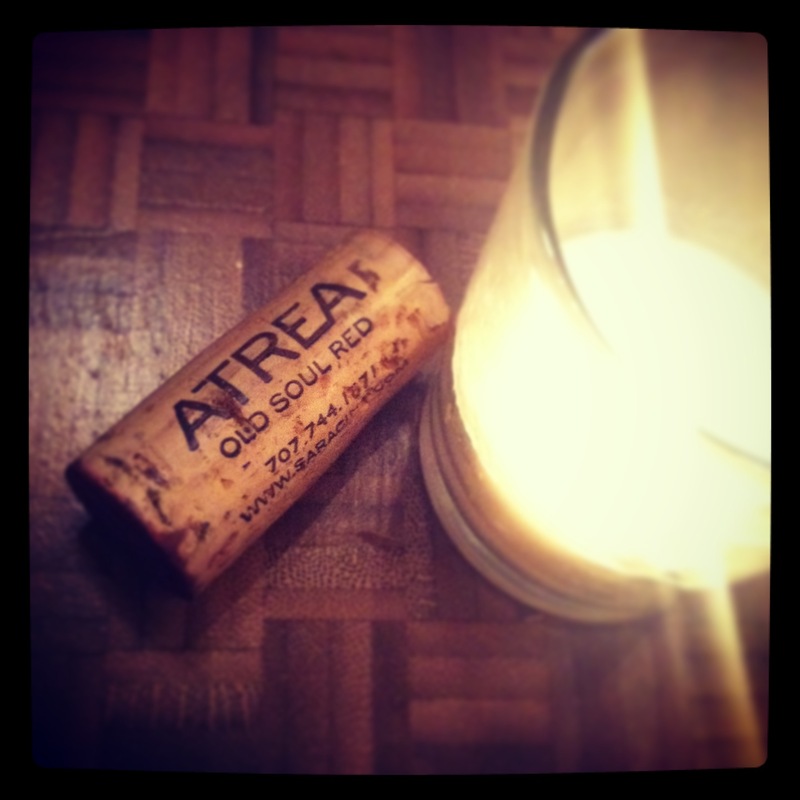 Sometimes it means pouring me a glass of wine before his own. Sometimes it means taking my crazy list to the grocery store and getting it all right. 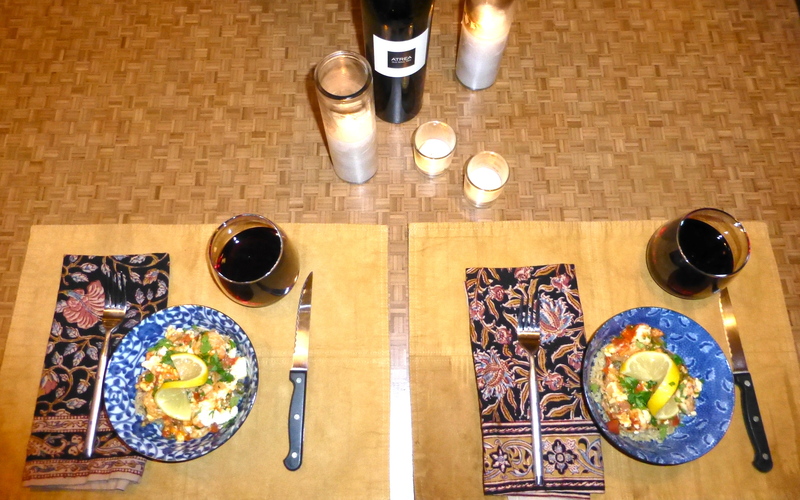 Sometimes it means offering to cook me dinner, and then stepping aside when I decide it will be good for me. 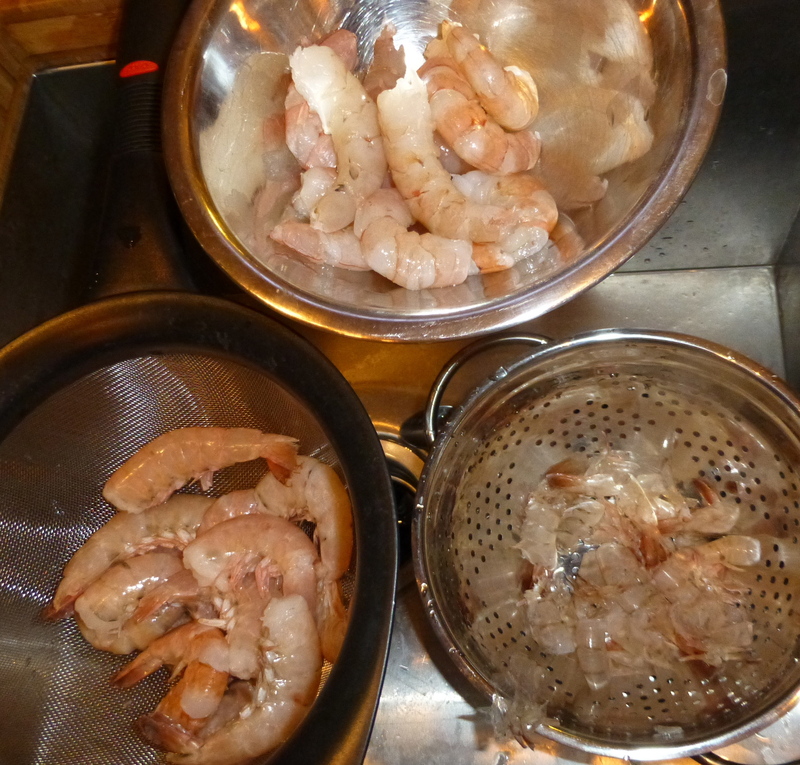 And sometimes it even means peeling and deveining shrimp for me. Yuck! Yesterday marked Day One of my attempt to significantly reduce my gluten intake. It’s not that I don’t love wheat and all of the glorious things it’s in; it’s actually one of a few changes I’m making in an effort to start a family. Did YOU know that gluten can make it more difficult to have a baby? Me, neither! 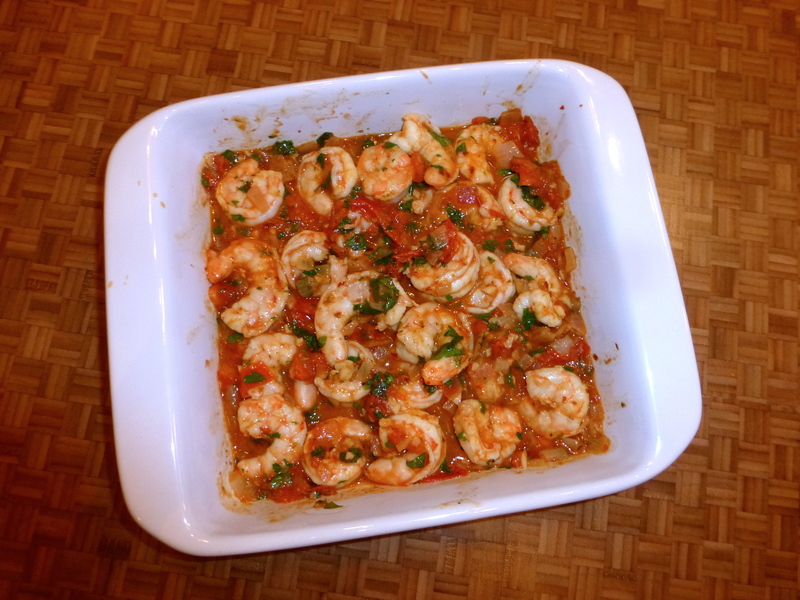 For dinner, I came across a shrimp recipe on Pinterest that is generally an appetizer. 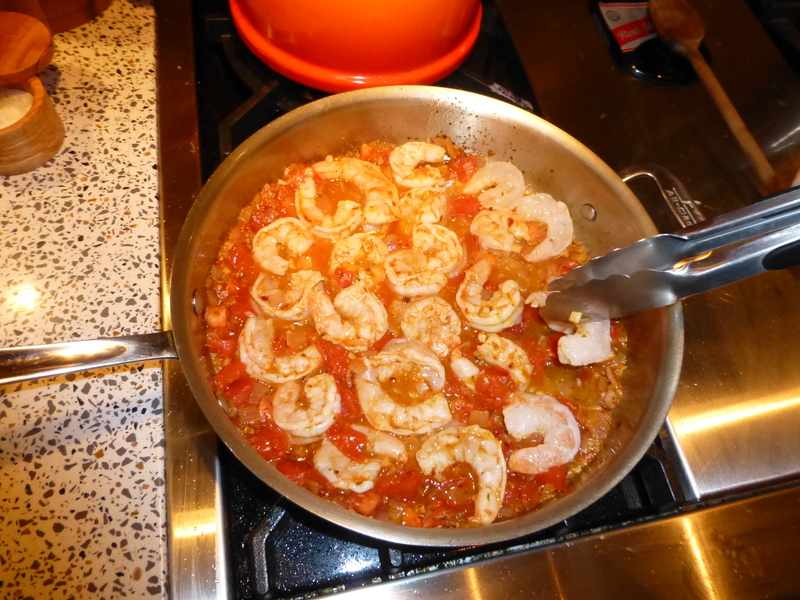 With a couple of tweaks, Shrimp Saganaki sounded like a tasty main dish. Bonus: it’s gluten-free! 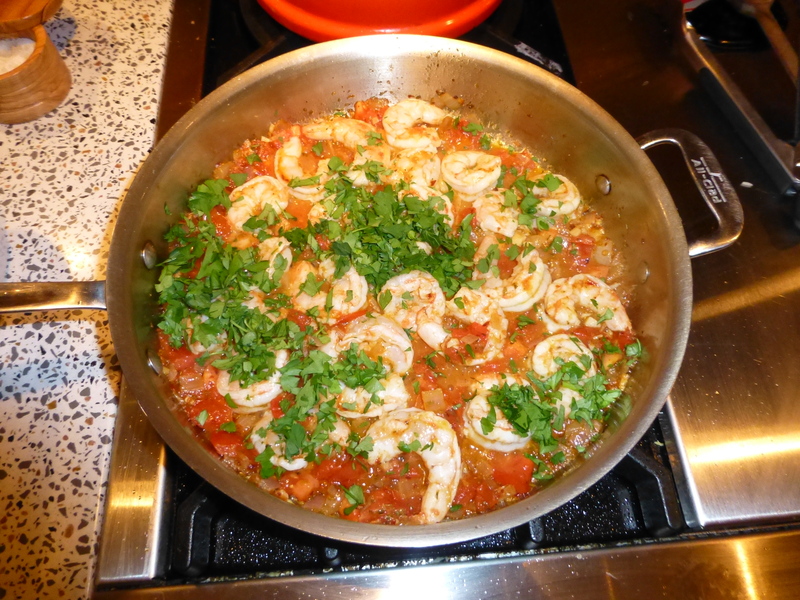 Shrimp Saganaki is basically shrimp baked in a spicy garlic tomato sauce. It’s full of tasty Greek flavors like oregano and feta cheese. 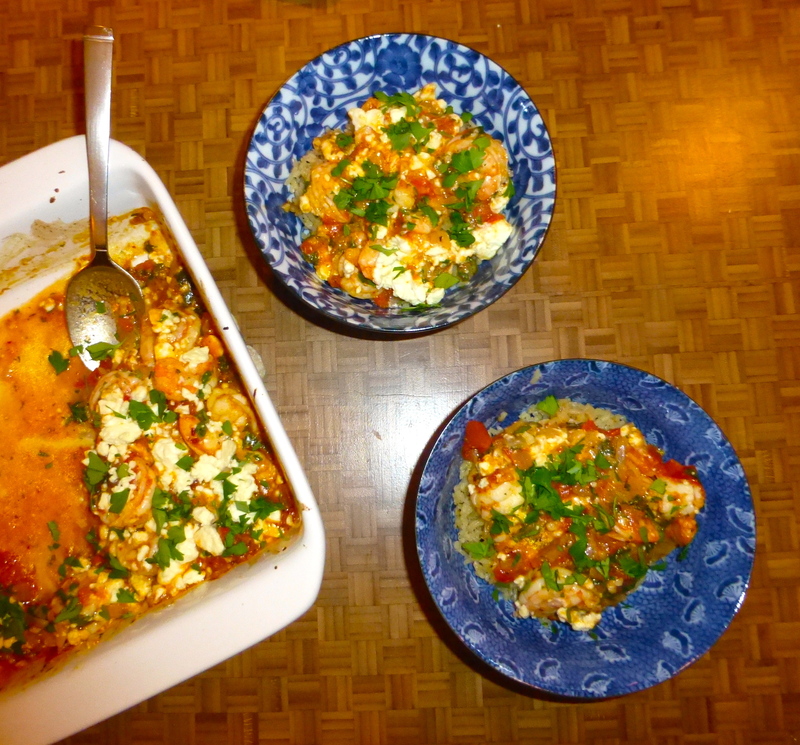 From the photo, it looked like the Greek version of comfort food. There are very few ingredients and very few steps in the recipe. PERFECT. 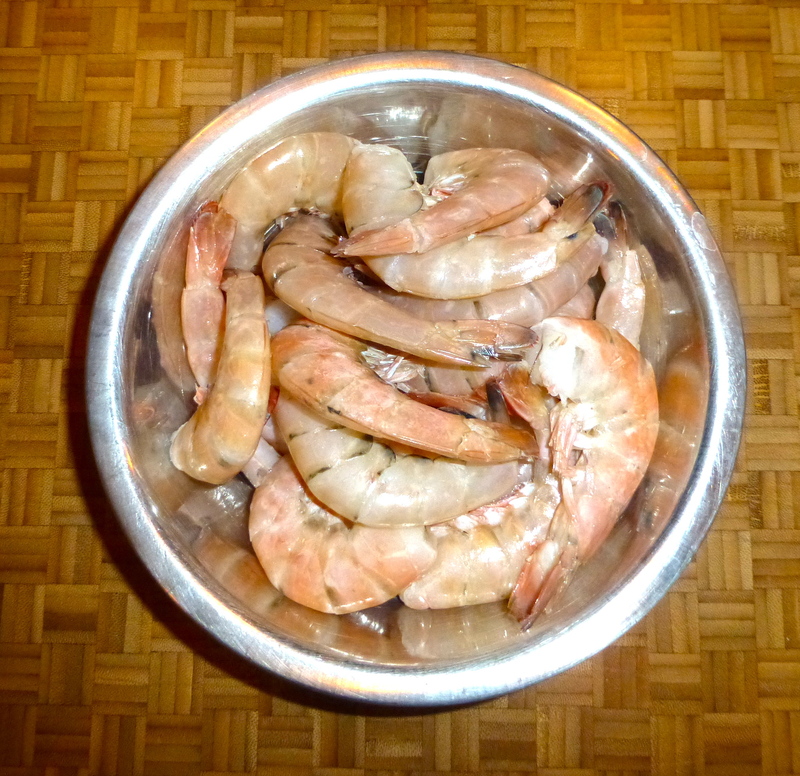 I got the oven heating up and prepped the veggies while Wonder Hubby took care of the shrimp. 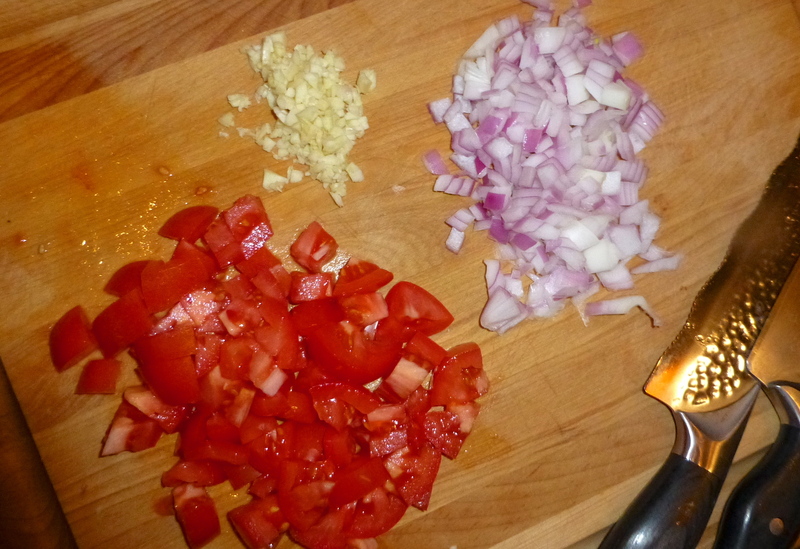 A big pile of garlic, tomato, and onion is a happy start to a meal for an Italian like me! 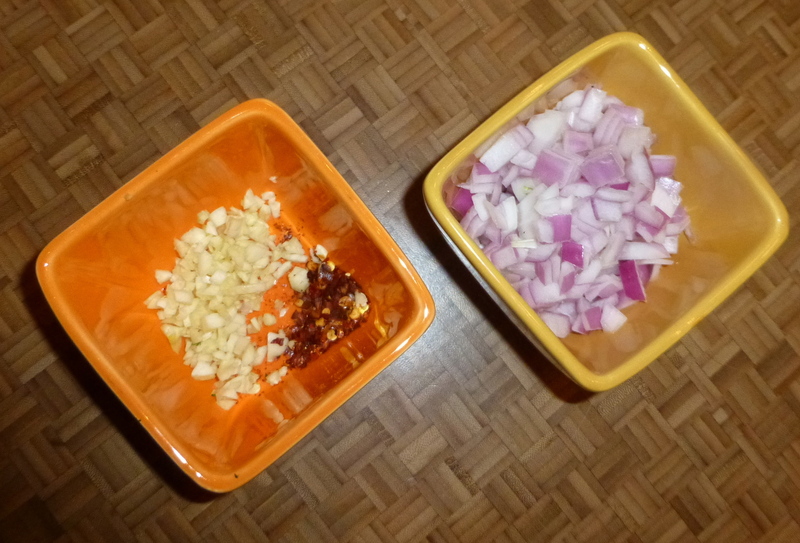 Because it sounded like the recipe came together pretty quickly, I had my prepped ingredients on hand and ready to go. First, the onion. 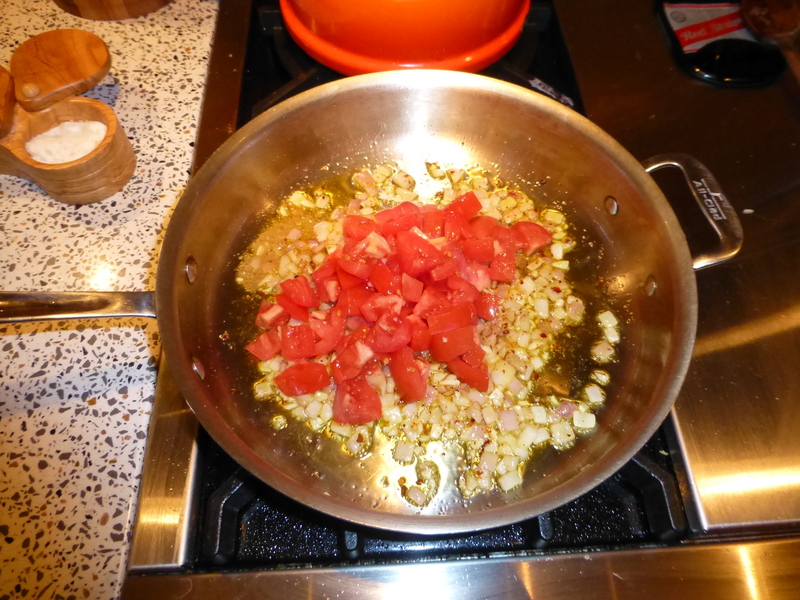 Next, the garlic and plenty of crushed red pepper. Ay ay ay! Spicy! 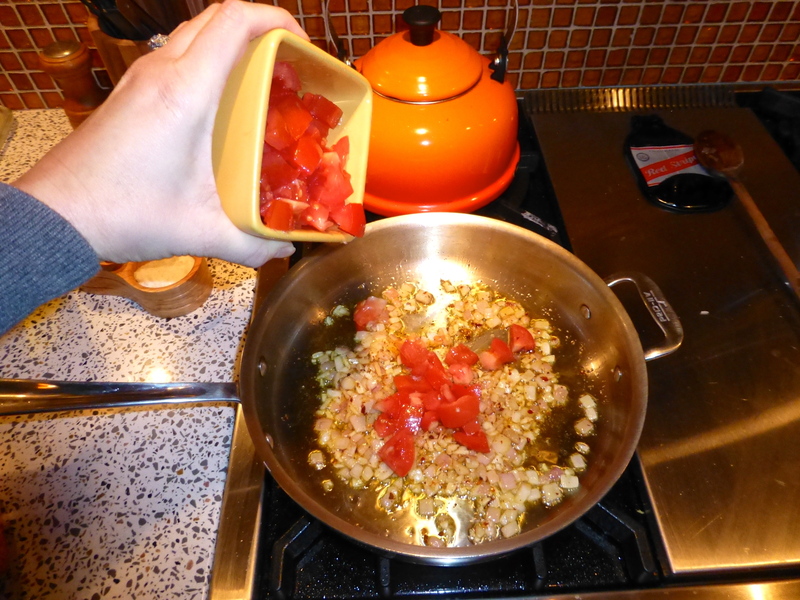 In went the chopped tomatoes and a generous bit of oregano. So far, so good DELISH. Here, the recipe called for OUZO, a licorice-y aperitif that is common in Greece. Shockingly, we didn’t have any on hand. 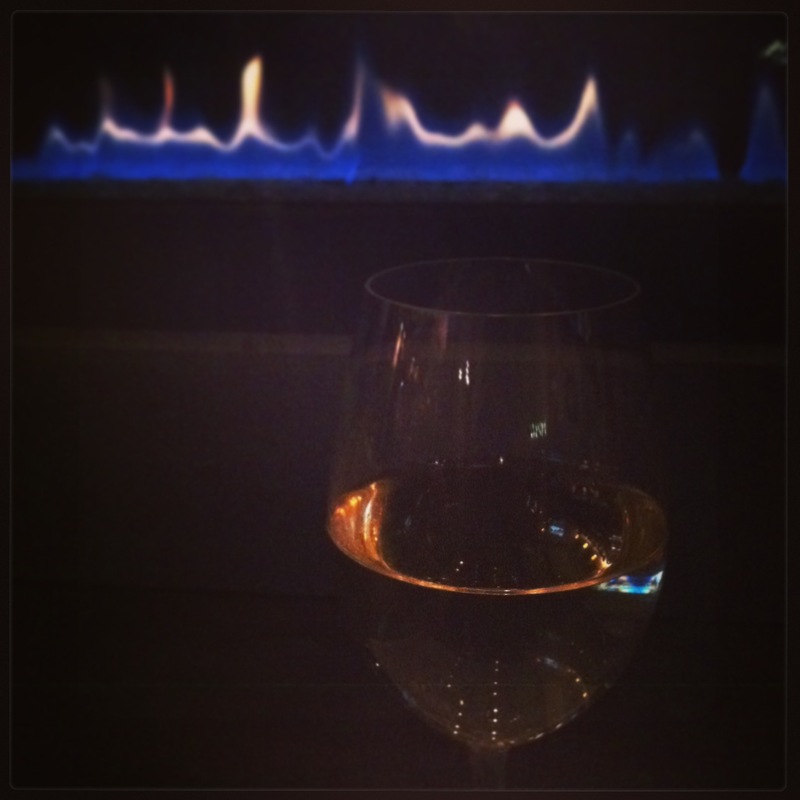 But I did have a glass of white wine on hand. IN hand, to be exact. Splash! 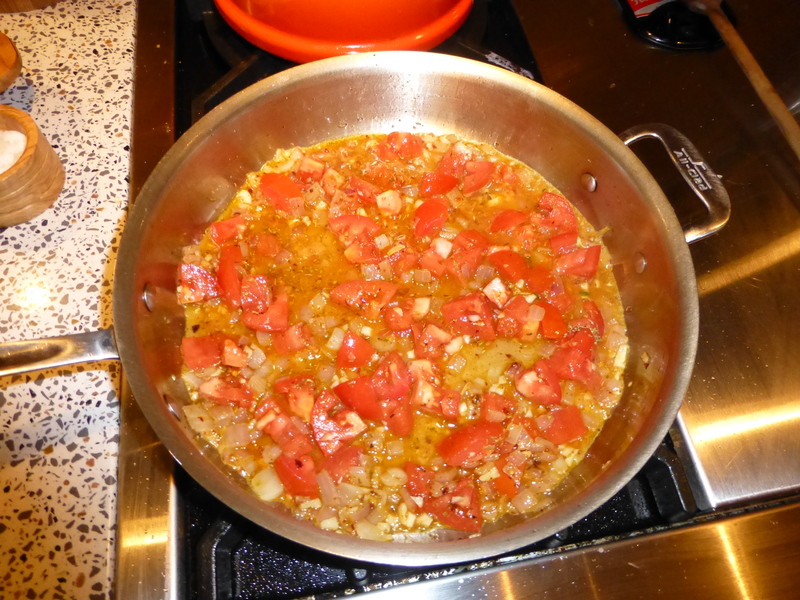 The tomato mixture simmered away, breaking down and creating a garlicky sauce. It was time to add the star: the SHRIMP. 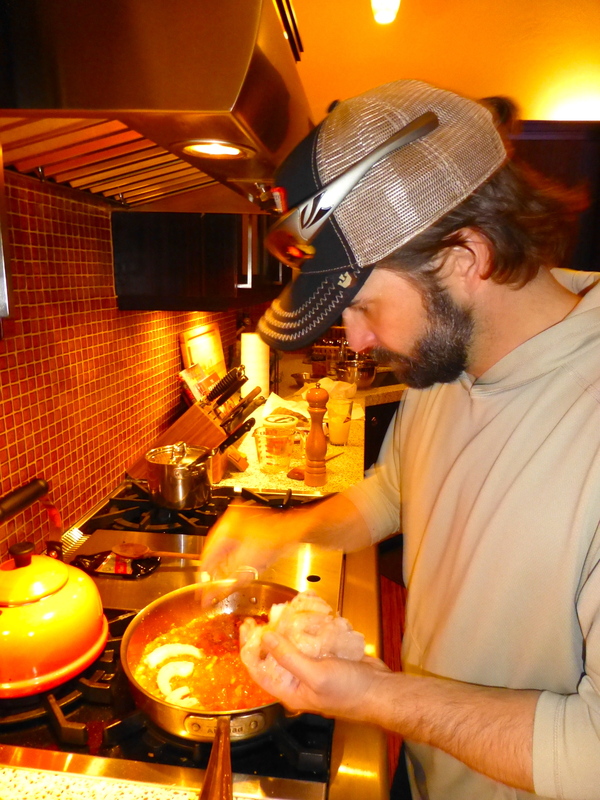 John was just finishing up with them, and nestled them gently into the sauce. He’s so cute. 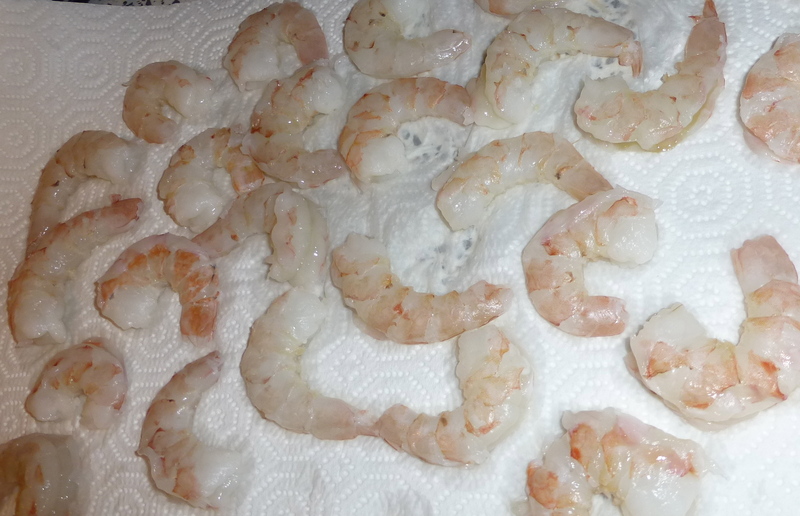 After less than a minute, I turned each shrimp over. Before they were cooked all the way through, I turned off the heat and stirred in a big handful of chopped parsley. 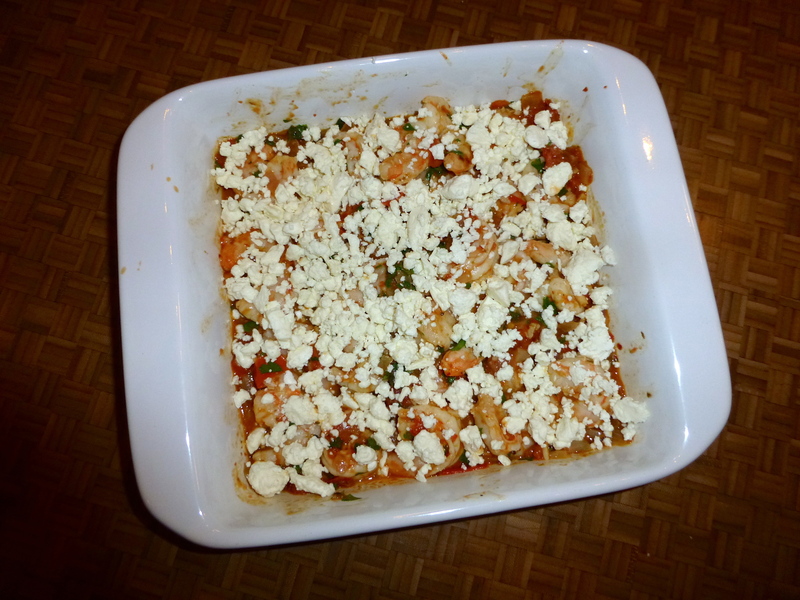 Next, the shrimp and all of the tasty sauce went into a baking dish, where I literally covered it with salty feta cheese! Cholula made sure the feta wasn’t poisonous. Whew! Close call. Truth: I can’t make rice. It’s either too al dente or too mushy- it’s NEVER right. So John made it! He sautéed the dry rice in a bit of oil first, then cooked it in chicken stock. 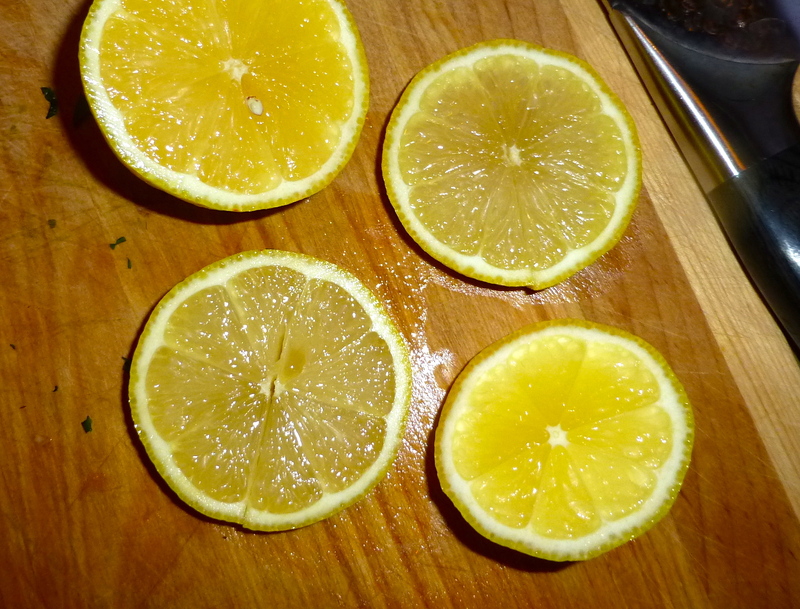 He added garlic salt, pepper, and Italian seasoning to the water, and I squeezed in some fresh lemon when it was done. It turned out perfectly done– and scrumptious! 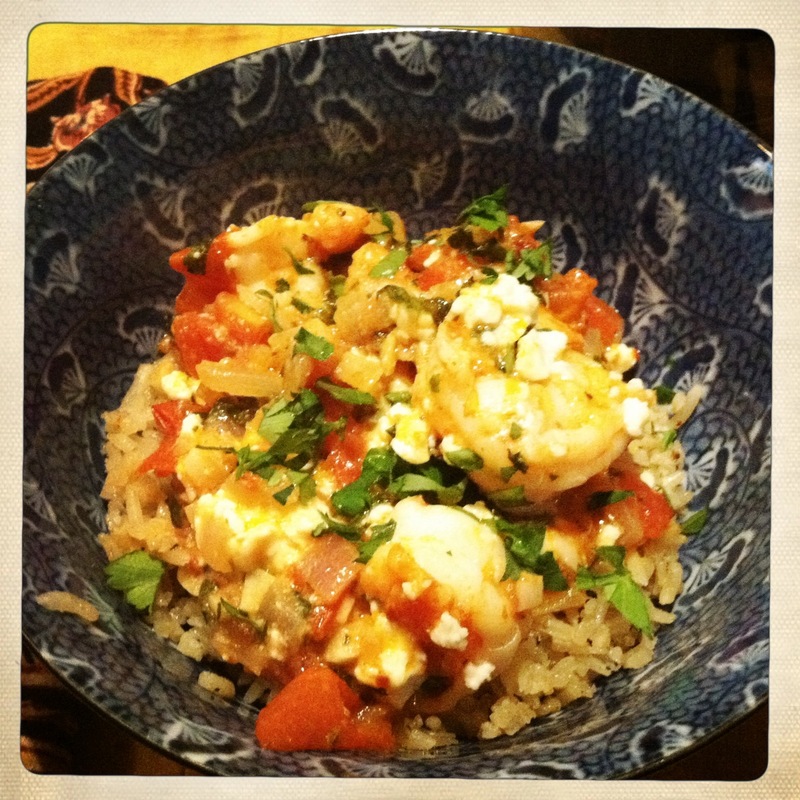 The shrimp only needed 10 minutes in a hot oven to finish cooking and for the feta to bubble into amazingness. It smelled incredible as it came out of the oven! 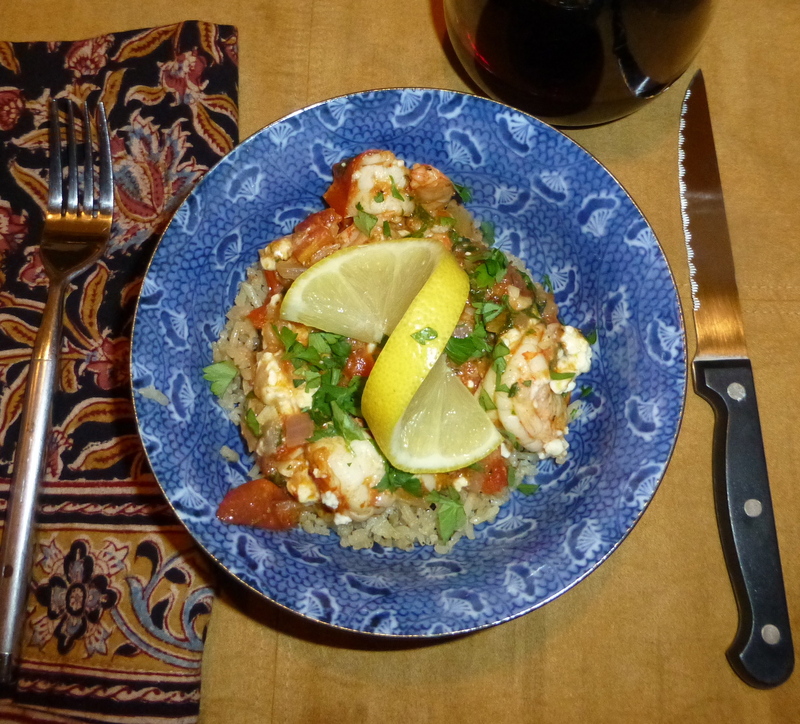 I served a scoop of shrimp and sauce over a scoop of the yummy rice and topped each bowl with fresh parsley and a lemon. Guys, this meal is no joke. It makes me happy when a simple recipe with just a few ingredients packs so much PUNCH. 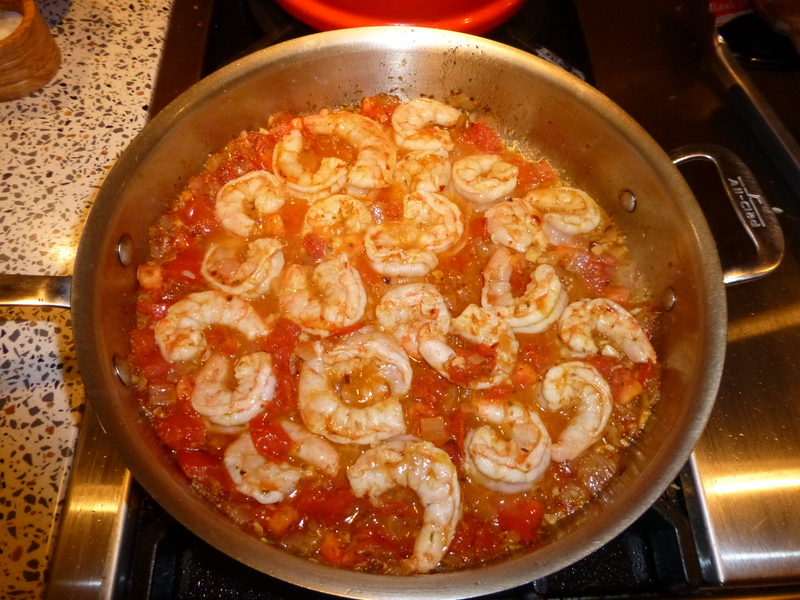 What more do you need than garlic, tomato, a few seasonings, and a splash of wine? Apparently, the answer is NOTHING because we both went back for seconds. After dinner, Wonder Hubby refused to let me clean up. He did all of the dishes, scrubbed the stove, wiped down the counters- all while dancing and singing “Life is a Highway” (with the wrong lyrics) to me. Those moments remind me how lucky I truly am. Heat the oil over medium to medium-high heat. 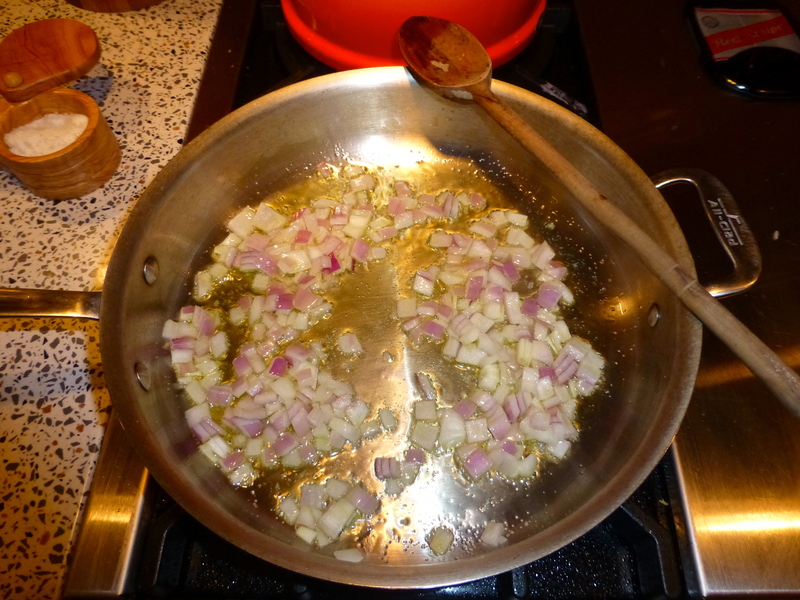 Add the onion and sauté until soft, about 5 minutes. 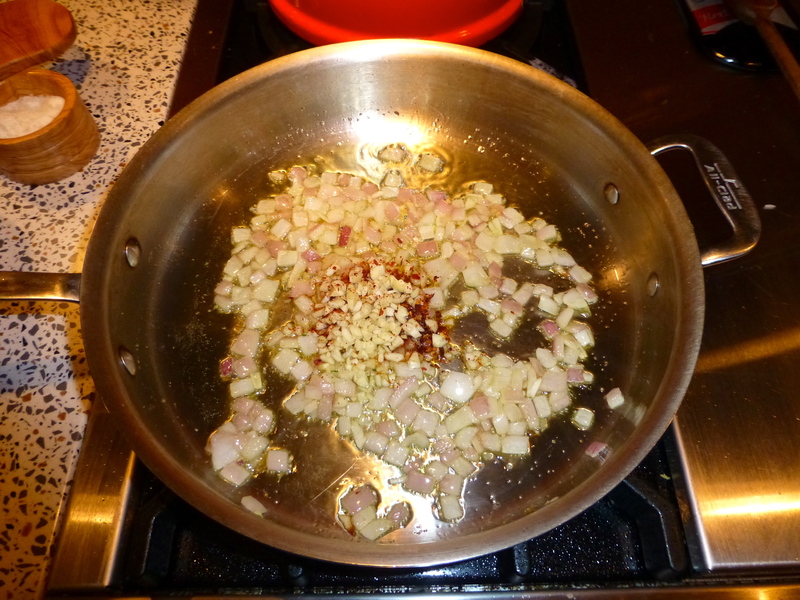 Add the garlic and crushed red pepper and sauté for another minute. 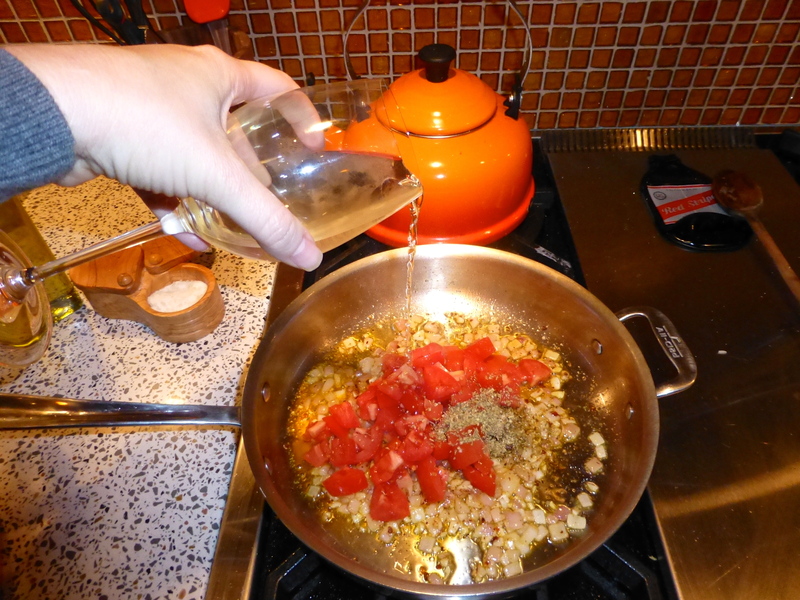 Add the tomato, oregano, and Ouzo/white wine. Simmer until the sauce thickens, about 5 minutes. 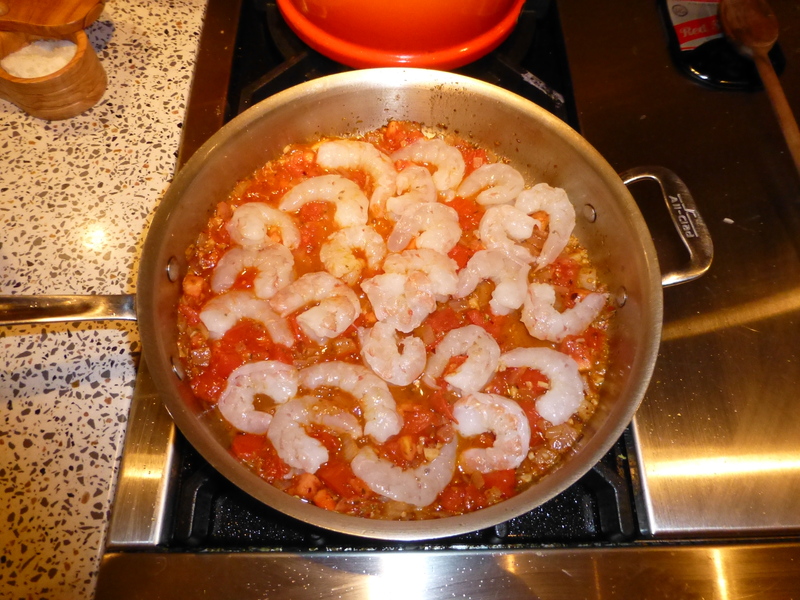 Add the shrimp and simmer for less than a minute on each side. Remove from heat and stir in the parsley. 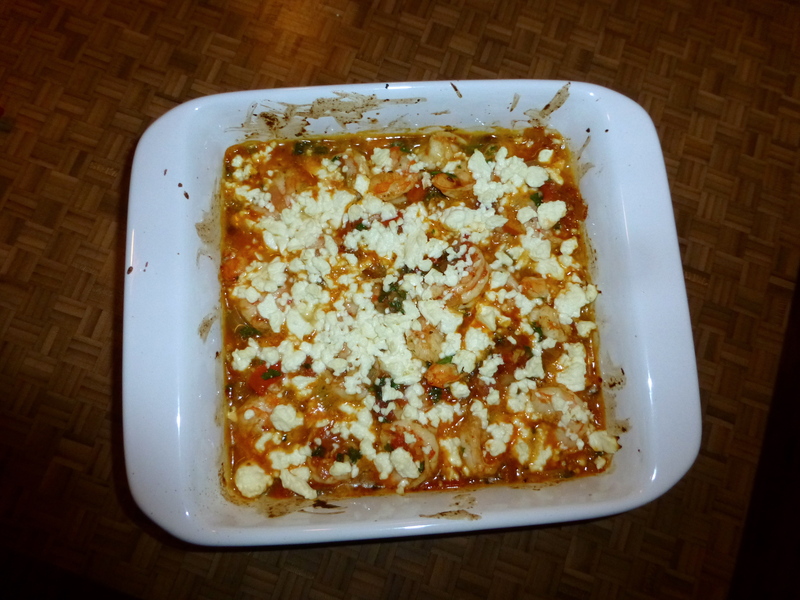 Transfer to a baking dish and top with the feta cheese. 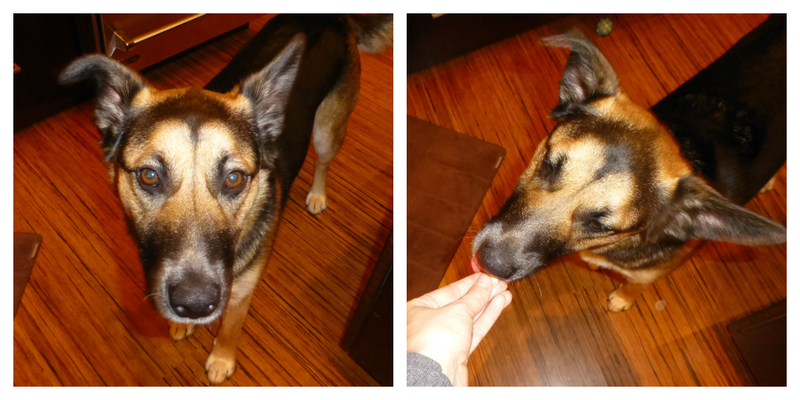 Give your dog a taste of feta. 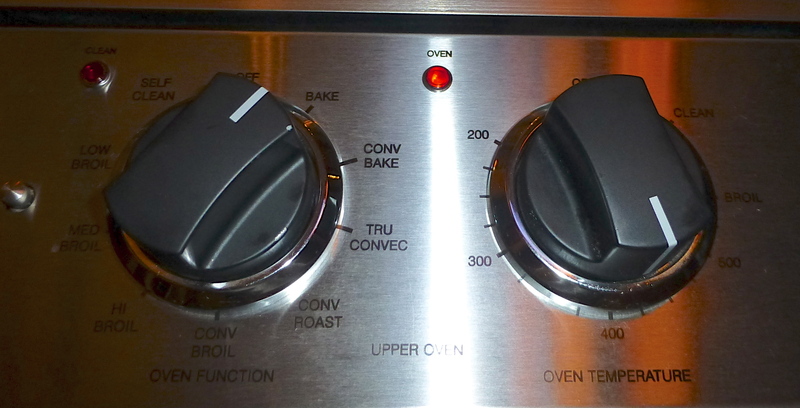 Bake at 425 degrees for 10-12 minutes, until the sauce is bubbly and amazing. 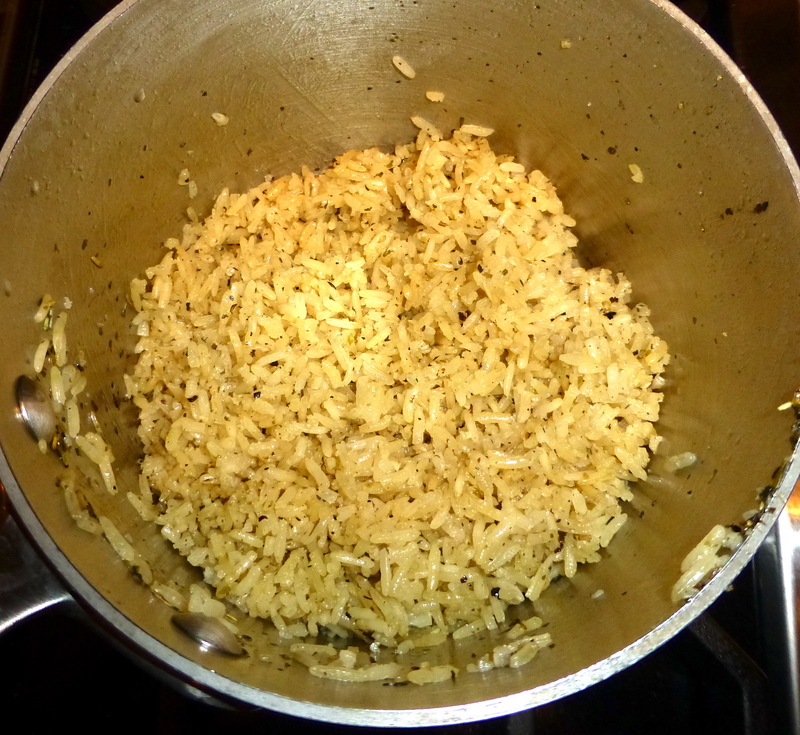 Serve over rice or with a big hunk of bread to scoop up the sauce. YUM. 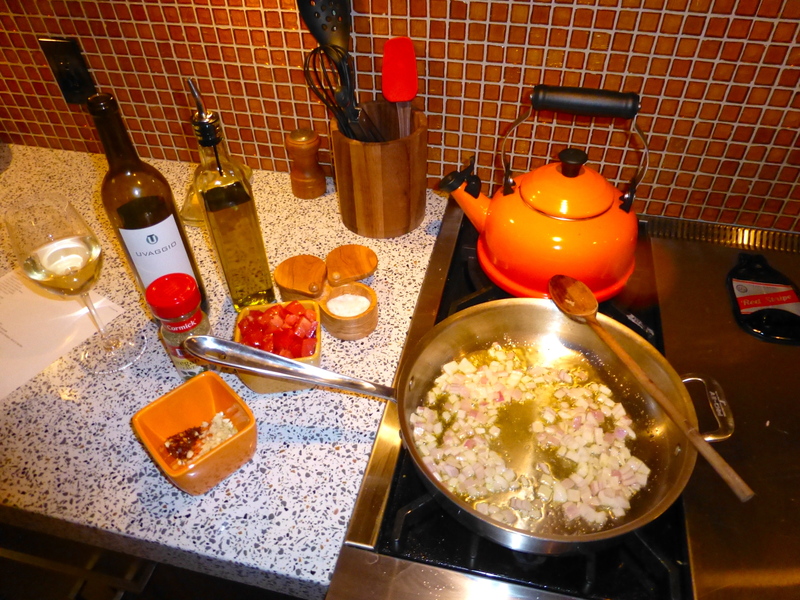 *For a full list of all of my recipes and culinary adventures, be sure to visit the FOOD BLISS link above! Previous postBad bananas (and good banana bread). What a great hubby, you are a lucky girl! Now we just need to get you set up with a rice cooker like we have and your rice will always be perfect. 🙂 Ours is a Cuisinart one that also has a way to act as a steamer in the top which is perfect for veggies. You should look into it! Whatever it is you’re struggling with these days, I’m so glad to hear your hubby has your back. The gluten thing and it’s correspondence with getting pregnant is quite interesting, isn’t it?! I’m doing my best to eliminate it from my diet, for various reasons, but have found some great blogs to help me out: http://www.cannellevanille.com/ and http://mynewroots.org/site/ These are my go-to’s for amazing recipes. Go, Amber! Thank you so much! My dad wasn’t feeling well and that, along with a couple other things that hit on the same day, had me down. John DEFINITELY has my back! Thanks for the blogs. I haven’t cut myself off 100% but am making more GF choices to cut way back. P.S. How do you stay in such good shape during the winter? I’m failing in that department! And back at you! 2013 is our year! As for staying in shape, I’m horrible. 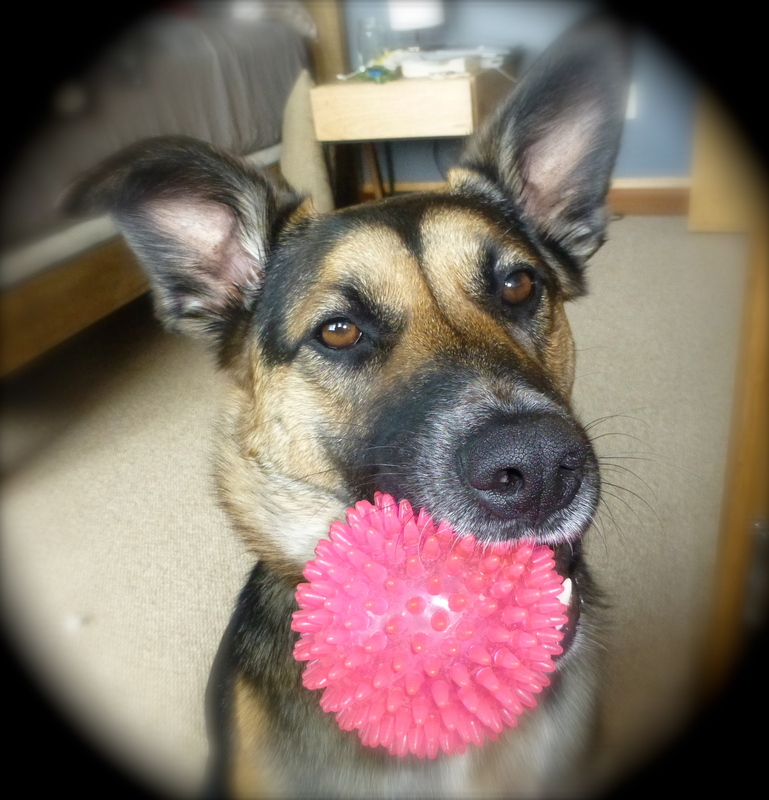 I trend toward lazy… trying to stretch and do yoga and get out with the dog more often! I’ve also been trying to go gluten free lately. Not for any particular health reason, it’s more of an “everything in moderation” thing. I’ve found that corn pasta tastes just like regular pasta. Also, I love to bake, and I have to say that not all gluten free flour blends are created equally. Once I found one I liked, I started using it in regular recipes, instead of wheat flour. It usually works out ok, although there is a slight texture difference. Happy baking! Good info on the pasta, though knowing it’s corn might just make me mad and want real pasta. 🙂 I’m going to have to figure out the baking thing. Hmmm. I’ve noticed that and I love it! Maybe this one will, too! that looks totally Greek (coming from a half Greek). 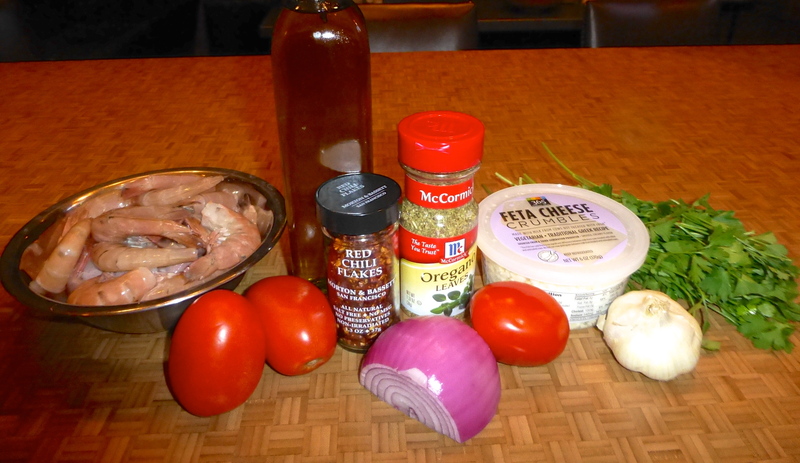 If you need more Greek recipes let me know, I am quite a good cook (so they say). On another note, isn’t that what love and partnership is all about? that he’s got your back? Glad he does. Hope you feel better soon. Ooooh, I’m glad I did Greek well enough to get props from someone who IS Greek!